Personal tutoring @BBS at level 4 will not be linked to a module and there will no longer be year tutors. A named personal tutor who (under normal circumstances) will be the same for the duration of their students. 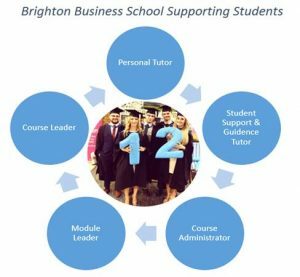 Student will be offered a minimum of 3 tutorials a year at level 4 and 2 at level 5, & 6 (combination of group and individual) to discuss engagement, progression, support and academic experience. Provides a central point of consistent contact within the academic team for the student and to foster a sense of ‘belonging’ to the University, through creating a sense of academic community with the School. Supports students’ awareness and use of academic feedback. The plan is that you will be the Personal Academic Tutor to your allocated students for the entire period of their study at the University. You are not a counsellor or the SSGT. Refer the student when appropriate. Must Read University Resources These resources are designed to offer practical advice and information to help individual tutors to: build confidence and skills to fulfil the role of Personal Academic Tutor as effectively as possible; explore some common issues; and understand the boundaries of the role, including when and how to refer students towards more specialist sources of support offered by Student Services. The website includes: resources for use in your tutorials, such as discussion prompts and advice on one-to-one conversations; links to and information about the various study skills support available at the university; contact details for support services for physical and mental health at the university; resources to refer your students to that can support academic development; relevant university and department policy documents on Personal Academic Tutoring; information about the Student Lookup tool available through StudentCentral; and interviews with staff and students talking about their experience of Personal Academic Tutoring.